I’m currently loving Bourjois Smoky Effect Pencil in ‘Sand Rose’. This grey/taupe/purple-ish pencil is ideal for daytime wear as it’s really subtle but effective at adding a bit of definition to my eyes, without having to resort to heavy black eye liner. I like how the colour is a bit unusual for an eyeliner and far more subtle than black, it’s perfect for a natural look. I like the whole idea of the brush at the other end for smudging/blending but don’t really find it works for me. It feels a little on the scratchy side. That being said I don’t think the brush is needed, this pencil blends so easily with a bit of a finger smudge that it’s not really needed. This is definitely work picking up if you want some subtle daytime definition for your eyes. 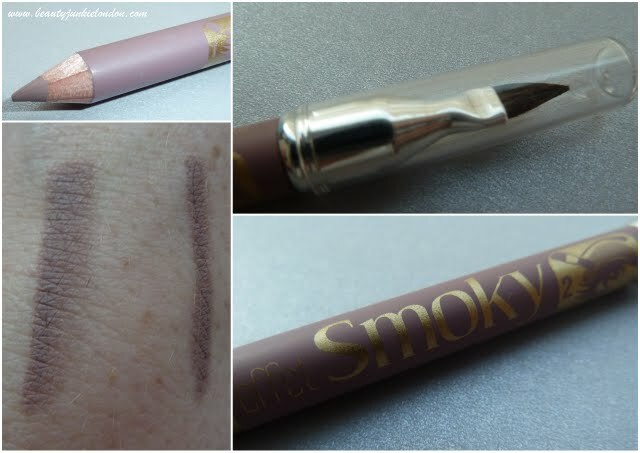 Bourjois Smoky Effect Eyeliner costs around £5 and is available from Boots.